In 1910, when the automobile industry was still in its early stages, businessman Hugh Chalmers had an idea. He decided to connect baseball with his Chalmers Motor Company. Chalmers wanted to use the sport to help promote his cars. But his idea was more than just a marketing ploy—it became one of the first versions of the modern Most Valuable Player award. According to author Rick Huhn’s book, The Chalmers Race: Ty Cobb, Napoleon Lajoie, and the Controversial 1910 Batting Title That Became a National Obsession, Chalmers was a baseball fan himself. Before the start of the 1910 season, he approached baseball’s National Commission with his idea. He wanted to give away one of his cars to the major league player with the highest batting average at the end of the year. A notice was sent to the players on March 25, 1910, to inform them of what was up for grabs. To be considered for the award, an infielder or outfielder had to have at least 350 official at-bats, a catcher 250 official at-bats and a pitcher 100 official at-bats. The plan was for the winner to be crowned at the 1910 World Series. The car was a valuable prize, even for major leaguers. 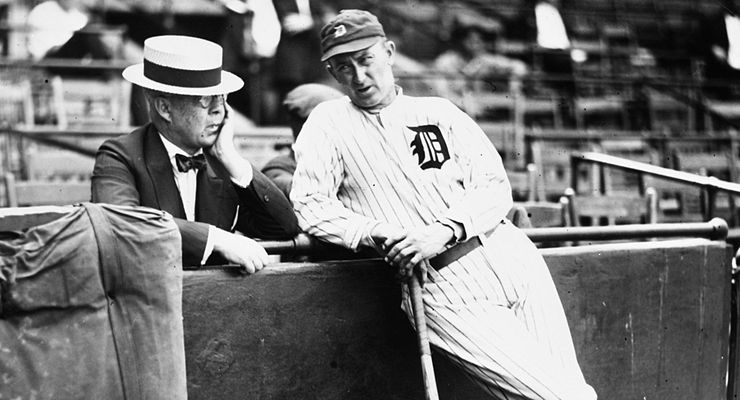 The Detroit Tigers’ Ty Cobb, who was already an automobile owner, and who purchased a car dealership in 1909, expressed his feelings to Baseball Magazine. Cobb was one of the favorites to win. He had already won three straight batting titles. In those days, the National and American League secretaries were the keepers of official statistics. Their tallies were the ones of record at the end of the season; other totals that appeared throughout the year were unofficial. But in the summer, the baseball world at least could look forward to the AL’s release of its official player batting averages for games through July 4. And when the stats were sent out in 1910, Cleveland Naps second baseman Napoleon Lajoie was revealed to be the clear leader. Lajoie was batting .403 in 236 at-bats. Lajoie’s primary challenger was Cobb, who had a .379 average in 269 at-bats. In the NL, New York Giants outfielder Fred Snodgrass had an unofficial average of .375 at that point of the season. But that was through just 88 at-bats. 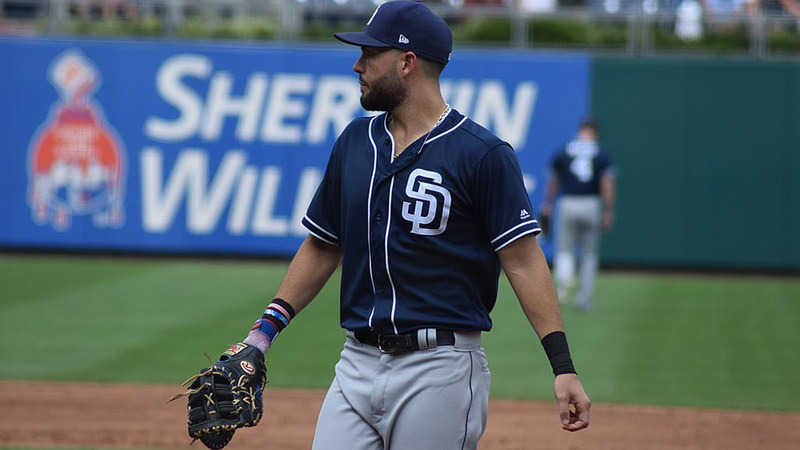 However, as the month of July progressed, Lajoie cooled, and Cobb passed him for the top spot in the batting average race according to an unofficial report for games through July 29. About a month later, based on games played through Sept. 1, the race was a tight one, with Cobb’s .362 average leading Lajoie’s .359. Plus, Boston Red Sox outfielder Tris Speaker wasn’t too far behind with a .347 average. Snodgrass had a .360 average in 258 at-bats. By the middle of September, Cobb and Lajoie were unofficially tied at .361. Meanwhile, Speaker was at .346 and Snodgrass was at .330. The jousting between Cobb and Lajoie continued as the month progressed. The unofficial tally through the Sept. 29 games, with a little more than a week left in the regular season, had Lajoie ahead with a .375 average as Cobb trailed closely at .370. During that final sprint to the finish, Lajoie’s Naps and Cobb’s Tigers faced off in a doubleheader in Detroit on Oct. 5. Both Lajoie and Cobb went 3-for-6 that day, and an unofficial batting average tally after that game showed Cobb at .382 and Lajoie at .374. Following that series, the Naps headed to St. Louis for a four-game, season-ending series against the Browns. And to close out their season, the Tigers went to Chicago for a four-game series against the White Sox. The games were scheduled to be played Thursday, Oct. 6 through Sunday, Oct. 9. Cobb had two hits apiece in each of Detroit’s first two games of its series, on Thursday and Friday, and he opted to sit out the final two games of the season and left Chicago. Cobb may have believed he had a safe lead over Lajoie in the batting average race, and the Tigers were out of the pennant race. But this was not a sure thing. The official numbers from the league wouldn’t be announced until after the season. Meanwhile, Lajoie went 3-for-4 in Cleveland’s first game against the Browns that Thursday. It rained on Friday, and Lajoie had three games over the weekend to put forth his best effort in Cobb’s absence. On Saturday, Lajoie went 1-for-4. But his one hit caused some controversy. It was a fly ball that St. Louis’ center fielder dropped. Many believed the play should’ve been scored an error, but it was instead ruled a hit, a double. The Naps and Browns would close out the season with a Sunday doubleheader on Oct. 9. And what transpired became a greater controversy. In Lajoie’s first at-bat that Sunday, in the first inning, he tripled. He followed that with a grounder to shortstop for a second hit in the third inning. In the fifth, Lajoie bunted for a hit. He had noticed that Browns rookie third baseman Red Corriden was positioned deep, at the instruction of Browns manager Jack O’Connor, and he took advantage. He bunted toward third again later in the game and came up with his fourth hit to finish 4-for-4 in the first game of the doubleheader. Lajoie continued to bunt toward Corriden in the second game. Corriden was still deep, and Lajoie wound up with four more hits. A fifth bunt, which came in the third inning, was ruled a sacrifice and therefore didn’t count as an at-bat. So Lajoie had an 8-for-8 day to cap the batting average race. But the legitimacy of the way Lajoie collected his hits—with his repeated bunts toward third base—was in question and the subject of critical commentary. And on Oct. 10, the day after the games and before the final batting averages had been calculated, AL president Ban Johnson began an investigation into the doubleheader in St. Louis. Had St. Louis aided Lajoie in his pursuit of the batting title? Both the Browns and the Naps were far back in the league standings, and the Browns’ O’Connor was fond of Lajoie. The integrity of baseball was at stake. Over the course of the investigation, Johnson received reports from umpire Billy Evans, who was working the series in St. Louis; the St. Louis Republic’s Richard J. Collins, who was the official scorer in St. Louis; and the St. Louis Republic’s Victor Parrish, who actually substituted for Collins and scored the Oct. 9 doubleheader. Johnson also met with Corriden, O’Connor, Browns owner Bob Hedges and Browns scout Harry Howell. Johnson declared that Cobb had actually edged out Lajoie in the final batting average tally. Cobb’s average, according to the statement, was .384944 compared to Lajoie’s .384084. This, according to Johnson, was based on Cobb’s 196 hits in 509 at-bats and Lajoie’s 227 hits in 591 at-bats. But some noticed that, based on those hit and at-bat totals, the averages were slightly off. It should’ve been .385069 for Cobb and .384095 for Lajoie. Interestingly, researchers in the 1970s found errors in the actual recording and tallying of the stats in 1910 that would’ve put Lajoie’s average over Cobb’s. Sporting News ran an article about the findings in 1981, but Major League Baseball decided against altering those stats. Earlier in the week, in the St. Louis Republic, Parrish claimed that Howell came up to the press box during the second game of the Oct. 9 doubleheader to ask how one of Lajoie’s bunts was scored. This particular bunt was the one that Parrish scored as a sacrifice. According to Parrish, Howell tried to get him to change his ruling to a hit. Parrish would not, and he claimed that after Howell left, the Browns bat boy handed him an unsigned note with an offer for a gift (a suit) if he changed the sacrifice to a hit. Then, after the game, Parrish claimed he received a call from a Mr. Lajoie asking, “There is no chance for you to see nine hits?” Parrish continued to refuse to change his ruling. Howell admitted that he went up to the press box during the game, but based on a copy of the note, claimed he didn’t recognize the handwriting. He said he was prompted to go up by both two members of the Naps and two from the Browns. And Lajoie admitted to calling Parrish, too, but also said he didn’t offer a suit or anything else to Parrish. He said he was prompted to call by Evans and by his fellow Naps. Despite all of the hoopla at the end of the 1910 season related to the chase for the Chalmers car, the Chalmers Motor Company wanted to continue the promotion. It was still good exposure for the business. But not surprisingly, the award format changed. This is when it morphed into something more reminiscent of today’s MVP award. Starting in 1911, the award would go to the players who had “done the most to help his team in its League pennant race.” One player from each league would be chosen based on the voting of the Chalmers Trophy Commission, which was made up of one baseball scribe from each city in the majors. Cobb won the award in the AL again in 1911, while Chicago Cubs outfielder Frank Schulte won in the NL. The two opted to bow out of the running for the award in 1912. Speaker (AL) and Giants second baseman Larry Doyle (NL) won it that year. Washington Senators pitcher Walter Johnson (AL) and Brooklyn Dodgers first baseman Jake Daubert (NL) were the top finishers in 1913. And Philadelphia Athletics second baseman Eddie Collins (AL) and Boston Braves second baseman Johnny Evers (NL) were chosen in 1914. The notion of an MVP award didn’t fade away for good, of course. Another iteration of the honor popped up in the 1920s and was called the League Award. It was awarded from 1922 to 1928 in the AL and 1924 to ’29 in the NL. In 1931, the Baseball Writers’ Association of America began voting on and administering the MVP award, and it stuck. The BBWAA remains in charge of the MVP today. But despite how far the MVP award has come, the debacle of 1910 is one that lives on in baseball lore. Wayne Epps Jr. is a recent graduate of James Madison University, where he was the editor of the student newspaper The Breeze. He has worked for The Boston Globe, USA Today and The New York Times. Follow him on Twitter @wayneeppsjr. I always heard that a lot of players wanted Lajoie to win because they hated Cobb. His habit of spiking players when sliding didn’t exactly endear him to opponents. I read a story a few years ago that argued that the most likely explanation for the Browns’ play was gambling and that the players simply knew the odds, placed bets, and played accordingly. That makes a lot of sense, it also explains Johnson’s actions. Until the Black Sox scandal baseball seemed to want to avoid the perception that baseball was associated with gambling and these incidents were swept under the rug with penalties made in private. As an outsider, one thing that I have always found confusing about MLB is how journalists and team scorers were allowed to determine if a hit was a hit, or an error. Why can’t MLB employ impartial people with no allegiances to attend games and work out what are hits and errors?